One in 20 British children under the age of ten believe chocolate bars grow in the ground and even more think flowers are man-made, a new survey revealed today. A shocking poll also found one in three did not know that potatoes grew in the ground and one in four had no idea what a spade was used for. Their parents did not perform much better, with 12 per cent unable to recognise a conker when shown a picture. Children, yet again, prove themselves to be completely ignorant about the basic things in life – like nature, food, and how to effectively fill in an online survey they don’t care about and may not actually be present during the completion of. A survey of 2,000 parents and their children for home shopping channel QVC has revealed how little many know about the natural world. In a recent survey conducted by One Poll, we asked 2,000 UK adults how gardening features in their family lives, both in their own childhoods and now. 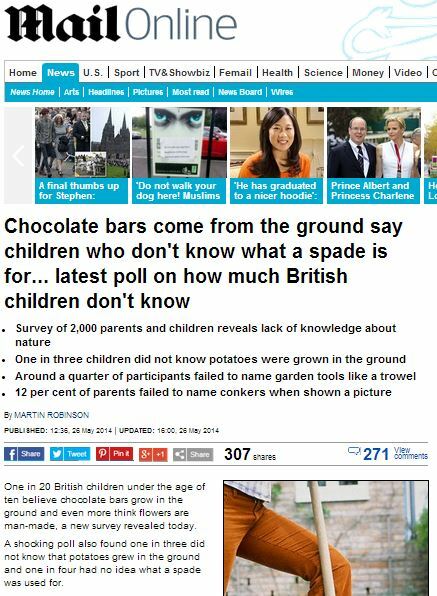 Our research even found that, of the children asked, 5% believed chocolate came from UK soil and 20% thought flowers were man-made. This is certainly problematic: as I’ve highlighted before, polling companies like OnePoll often have inadequate means of ensuring children are actually taking web surveys designed to gauge their opinion, and could arguable be said to actively incentivise parents to take polls on their child’s behalf… utterly invalidating the results. So, when newspaper articles declare the youth of today to be ignorant, based on an invested party employing a web survey company with questionable research methodology, I tend not to panic (at least, not about the youth of today – though the state of the media landscape that leads to the publishing or blatant PR as pseudosociological news does raise the blood pressure somewhat). Bosses at QVC are launching a Watch Them Grow campaign encouraging parents to spend time gardening with their children. Of course, the new campaign has almost certainly nothing to do with the extensive gardening range on offer on the QVC website, even if they explicitly urge you to browse their garden products in the Call To Action at the bottom of their report on the ‘research’. They’re not instructing you to buy from them – they’re merely planting the seed. This entry was posted in Uncategorized and tagged 72 point, daily mail, martin robinson, onepoll, pat spungin, qvc on June 5, 2014 by Michael Marshall.